It’s uncanny! Just the other day I was thinking, I haven’t seen any posts about bloggers receiving awards lately. Perhaps that’s a seasonal activity. When BAM – much to my surprise and delight, my dear friend Marci at Fuzzy Undertones nominated me for the Wonderful Team Member Readership Award. This nomination is special to me because it’s an Award for Readership. I am a more active reader than writer, devoting more time to reading blogs and commenting than to publishing my own posts. Part of that is a conscious effort to support other bloggers. Although I’m a newbie blogger, I am an elder citizen of “my” world if not “the” world. I understand how important support and guidance are, especially in these times when public discourse can be so hurtful. If I can use my experience and skills to exhibit positive etiquette and supportive, meaningful comments in the blogging world, it’s a small legacy I take pride in. WOW – high praise indeed. Thank you again, Marci. Why do I read such a wide variety of blogs? I have an insatiable curiosity which is increasing as I age. I am fascinated that so many global bloggers willingly share your life experiences, your opinions, and your imagination with me. I feel every connection sending out ripples that expand my world and induce me to think more deeply about the people in it. Reading blogs is truly reading an anthology of humanity, and I am privileged to participate as well as bear witness. This post is getting long enough, so I will save my “What traits do we desire in our readers?” for a new day. Lainey is one of my first, kindest and most supportive readers. She often links to bloggers I recommend and supports them, too. What can I say about Justine? Always here; always upbeat; a little naughty; a reader I adore. Another regular reader who rarely stops at one (always meaningful) comment. Celine is all about connections, and will brighten your day. Although I don’t hear from Silvia as often, she leaves such thoughtful comments that I know she does more than skim my posts. She truly thinks about what I’m saying and offers plenty of good insights. Another reader whose opinions I appreciate; we don’t always see eye-to-eye, but we always learn from each other. All my readers deserve to be mentioned, and I will continue showing my appreciation in my ongoing “shout-out” posts. And a PS to my favorite crone, Linda, I have a special surprise coming for you 🙂 Soon ! Oh, I almost forgot – for the above nominees, here are your acceptance rules. As always you can follow them, ignore the award entirely, or “bend” like I do. That’s the beauty of free speech. 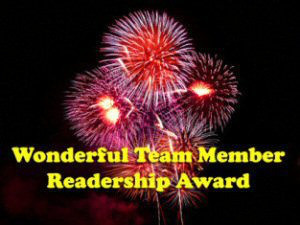 1.The Nominee of the Wonderful Team Member Readership Award shall display the logo on his/her post/page and/or sidebar. 2.The Nominee shall nominate 14 readers they appreciate over a period of 7 days (1 week) – this can be done at any rate during the week. It can be ALL on one day or a few on one day and a few on another day, etc. 3.The Nominee shall name his or her Wonderful Team Member Readership Award nominees on a post or on posts during the 7 day (1 week) period. 4.The Nominee shall make these rules, or amended rules keeping to the spirit of the Wonderful Team Member Readership Award, known to each reader s/he nominates. Thank you, Elsie. I really appreciate you, and your comments are always so supportive. Congrats on your award! I agree–there is so much good stuff out there, from all over the world. It can be tough to close the browser! Not a more deserving person can I think of to receive this award. Your support and kindness is unending it seems. You are what all good friends, sisters, crones, should be. Thank you for being you! Thank you so much, Linda :-). You bet, Maggie, and thank YOU for being my faithful reader! Thank you, Marci 🙂 the BLoving Connection continues (to a jazzy little tune). Thank you, Sammy. I appreciate being valued as a reader. Hey, I appreciate your curiosity, because I so understand it. I can’t go on without knowing, and constantly find myself researching and searching terms and new things, constantly wondering: how can there be so much I don’t know? 🙂 Your blog has a honesty quality to it, a great openness, and that’s one of the many reasons I like being here. Thank you, Silvia. I really appreciate your kind words, and have found a maturity in your blog and comments that always teach me something, especially because you can see things through foreign eyes in a way I can’t. Congratulations! What a fantastic spin on the blogging awards…..I love it. Without regular, supportive and kind readers we’d feel like we’re just talking to the cat…lol. You are welcome, Lainey. You brighten many days for many bloggers with your presence! I’m going to be a little late in passing the award on (real life is getting in the way of blogging – shocking) so watch this space! No problem -don’t even “back-burner” this award. Who needs that hanging over your head. You’ll get many more opportunities to respond to awards. I’ve learned to take the pressure off by just letting some of them “go”. Take care of yourself in your real life stresses !! Congratulations on your award! I know from personal experience that it is well-deserved. I thank you for your kind comments on my fledgling blog and am looking forward to reading yours. Thanks for visiting and your nice compliment. I was blog-surfing last night and can’t resist a wanna be cowgirl 😉 look forward to reading your posts. Yes that’s true! I haven’t seen any either for quite some time. Lucky for me, I guess!!!! A worthy award for a worthy individual! It couldn’t happen to a nicer person! Well done Sammy, so well deserved. You’ve always been so kind and generous in your support, and I just KNOW that you’re someone I would love to meet. Meeting you over the blogosphere is one of the joys in my life. Oh Susan, thank you so much. Your posts are so thought-provoking and you have such an expertise in your areas of passion, I almost feel too simple and frivolous to be worthy of your praise. But I keep returning because you are a fount of wisdom. Congratulations on receiving this award, Sammy and may I say, well deserved! 🙂 You’re obviously a caring, supportive person and have so many friends around the Blogosphere. It was a pleasure meeting you during the AtoZ Challenge and I’m glad our relationship has continued beyond that. Cheers to you! Thank you so much, Debbie! This has been such a rewarding enterprise for me, all because of bloggers like you. BTW I haven’t forgotten about the award you gave me. I’m still musing about my post because your questions caused me quite a kerfuffle! In a good way! A bemuzin’ way 🙂 And you know by now I’ll do my own thing in my own time ! No worries, Sammy. 🙂 I always said participation was optional and doing one’s own thing is the best way, for sure. Congratulations. You deserve to be awarded! Thank you, Paula. You are an inspiration in so many ways. Prayers to your family.